For some time there has been a movement afoot to build a mausoleum here. Messrs. Thielman and Struve took up and met with such hearty support that the company has consented to build here on the condition that one hundred more crypts be subscribed for, and from all appearances, this will not take long to secure. The idea of a mausoleum burial is not a new one, as they have been in use for a thousand years, according to history, only in olden times the sanitation feature of the modern mausoleum was lacking. A mausoleum is a beautiful resting place for our loved ones who have departed from this world, and is a safe practical, up to date mode of burial, doing away with the watery, unsightly, open grave. A mausoleum burial is cheaper than any other, as it does away with the annoyance of the tombstone salesman, while each holder of a crypt can rightfully point with pride to the beautiful building as his future and last resting place, and can call the building his monument. In the past only the rich could afford to build mausoleums for their loved ones departed from this world, but now, under the modern co-operative plan, everybody who can afford $200.00 for a crypt can have the same sanitary, up-to date, modern burial, and rest assured that when his time comes he will be placed in a clean, dry place, and knowing that it will remain intact a hundred or a thousand years from now, no foul weed growing over his grace, or that his tombstone may fall on him, as is the case in many cemeteries. 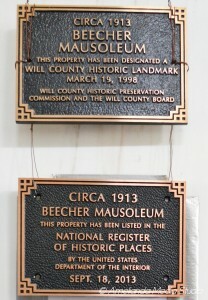 The modern idea of mausoleums is becoming so popular that over 700 have been built and more are under construction, and as it depends on the people of each loyalty, makes it possible for Beecher to also get such a fine building that will be a credit to the town in every respect, and as Beecher and surrounding country has more public spirited men who take pride in doing something for their town than many places much larger, there is no reason why Beecher should not be in line and have a beautiful mausoleum. 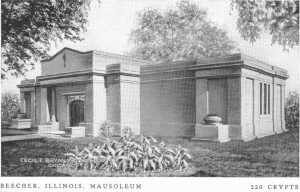 Now a few words as to what a mausoleum is. It’s a fine building constructed entirely of concrete, cement and reinforced steel, the inside being of marble. This building is divided on the inside into compartments, each to hold one body. When a casket or body is placed in the compartment, it is sealed up with cement and a marble plate is fastened on, bearing an inscription the same as on a tombstone. The building itself can never be destroyed by storm or fire, as there is no wood used in its construction. The upkeep of the building is provided for, as there is $5.00 set aside for each crypt. This fund is put out on interest, which is sufficient to pay for the sweeping and washing inside the building when necessary. The control of this fund is left entirely with the people who own crypts in the building. Each crypt holder gets a deed to his crypt. There are no taxes or assessments. Taking all this into consideration, it is no wonder that the idea has become so popular. People work and save all their lives to accomplish something. Why should they not, while living, also provide for a clean dry resting place after death, and have the assurance that they will not be forgotten? The bible says while you are living, prepare for death, and this is one way of doing so. It is left to the living to build the mausoleum, but even then we do not know how soon our time may come and when we may be called beyond the ever-great unknown.